The leaves of the rockrose Cistus ladaniferus are covered by glandular hairs exuding an odoriferous resin called labdanum. It has a warm, sweet-resinous, woody-ambery odour. It is one of perfumery's classic ingredients. C. ladaniferus is typical of the dry-land vegetation ('maki') of the Mediterranean countries. In Cyprus, for example, there are large brushwoods of C. ladaniferus. 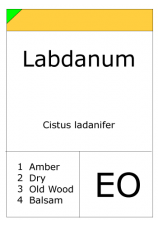 Goats and sheep in the hills get their fur sticky with labdanum. Formerly the shepherds collected this material from their animals and sold it to buyers at the sea-ports. In ancient Egypt, the false goat-hair beards of the pharaohs were impregnated with labdanum to surround these men with an impressive aura of distinction. The Cypriotes mixed labdanum with styrax and calmus oil, thereby creatinng an early classic of perfumery. The Crusaders became so enthusiastic about the fragrance that they brought the recipe to Europe. Known as the 'Chypre'-theme, it is still employed in modern perfumery. 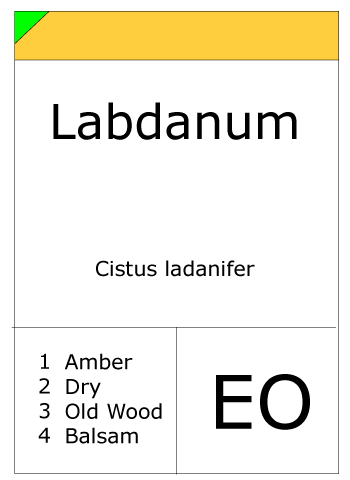 Cyprus, Crete, the Esterel Mountains in southern France, Spain and Portugal are the main production sites of labdanum. Today the crude Labdanum gum-resin is obtained by treating the cut plants with hot alkaline water to catch all the surface waxes, resinous matter and oily parts from the plants. Steam distillation of the gum yields about 2 % of labdanum oil, which is extensively used in perfumery. It has a powerful, diffusive and very substantive odour with strong notes of incense and ambergris. The oil is an extremely complex mixture of mainly oxygenated terpenoid compounds C10-20. Weyerstahl et al. detected more than 300 constituents in a sample of fcommercial labdanum oil, 186 of which were identified. The main compound was ledene (9 %). Among the constituents having an ambery odour, alpha-ambrinol, ambrox and drimenone were identified. By using GC with sniffing, Ramalho et al. found that 2,2,6-trimethyl-2-cyclohexenone was an important woody-smelling constituent of labdanum oil from Portugal.